If you have been using iPhone, iPad, and other iPod, then you must be aware of iCloud service. iCloud is a remote server backup solution to save private data, such as videos, music, photos as a centralized system. When you turn on iCloud on your iPhone , all selected content will get automatically uploaded to iCloud server. 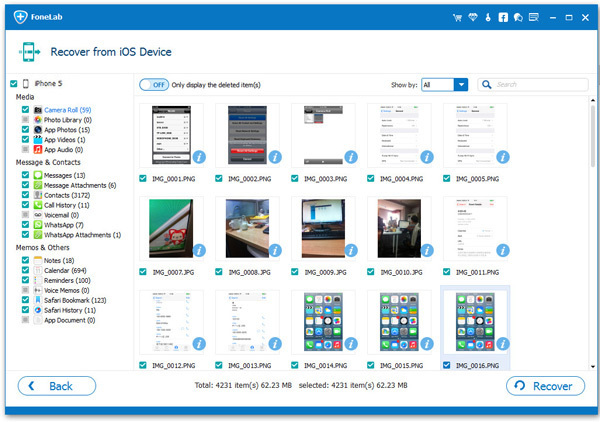 Now you can access all those stored media files from any device, like iPad, iPhone, iPod touch, Mac at anywhere and anytime. One of the most distinguishing features of iCloud is that it backs up your iOS device every night when they are connected to a secured Wi-fi network. So if you get a new iPhone, you can easily restore iPhone data from iCloud account. Initially only 2 GB iCloud storage is for free. But if you wish to expand its capacity you need to buy the space at different price for different space up to 2 TB. So iCloud is indeed a beacon of light for those users who does not prefer to clog their device with too much media files and need a separate space to stuff them. 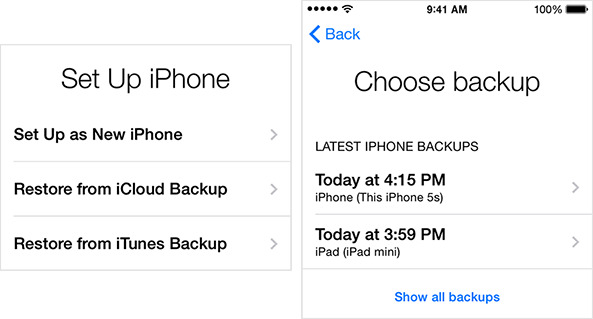 The procedure to restore your iPhone from iCloud backup is not that difficult to pull off. Just follow the steps explained below for a better functionality. Step 1: Turn on iPhone and go to "Settings" menu. Step 2: From the "Settings" menu, select "General" tab. Now, tap on "Reset" button. Step 3: From the list of available options, click on "Erase All Contents and Settings". When the iPhone turns on again, simply follow the instructions shown on the screen to set up the device again. Step 4: On reaching "Apps & Data Screen", tap on "Restore from iCloud Backup" option. 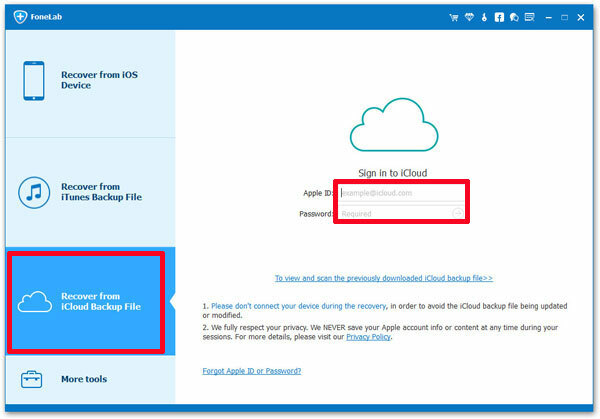 Now, sign-in to your iCloud account with your Apple ID. Check file types and select the ones you really need. After that, the transfer process will begin. Step 5 : Keep iPhone connected to Wi-Fi until a bar turns up notifying the completion of the restoring procedure. Depending upon the speed of the network and the size of the backup files, it might take from few minutes to several hoursto finish. WARNING: If you disconnect your network or Wi-fi connection in the meantime, it would simply pause the progress until you reconnect again. Thought the previous method was sufficient enough to perform the job, yet it had many lagging characteristics which are dealt with most of the users after the restoration is complete. Once the restore is done, the new data before iCloud backup date would got deleted by default. In order to avoid this situation, we have come up with wonderful iPhone Data Recovery tool. It not only restore the backup from the iCloud server but would also prevent the data from missing. It is specially designed for iOS devices to recover lost or erased files from iCloud backup surprisingly even without your device. Supporting: iPhone X, iPhone 8/8P, iPhone 7/7P, iPhone 6S/6/5S, iPad and iPod. Step 1: Download and install the software on a computer. 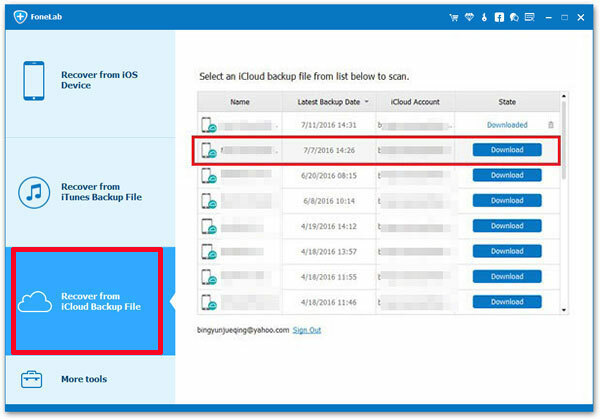 Launch the program and choose "Recover from iCloud Backup File". Step 2: Type Apple ID and password to sign-in to your iCloud account. Step 3: After the sign-in is done, you will get to see all your backup files in a list. Select the particular backup file that you wish to restore, and click on "Download" option next to it. Step 4: When the pop-up comes, you can select which files you wish to restore by ticking them, like images, messages, music, etc. Finally click "Next" to download the selected iCloud backup files. Step 5: After the downloading is done, the software will scan the data and would display the content categories on the left side of the pane and details on the right side. Step 6: Mark the files that you intend to recover by clicking the "Recover" button. This will start the program to restore all the deleted files on your iPhone from iCloud backup to your PC. iCloud is indeed like a portable online storage which can be accessed anywhere from any iDevice at anytime. But the real problem starts when you decide to restore your backup files from the iCloud as there is a high chance a lot of your data may get lost in the meantime while the restoration is being done. Thus iPhone Data Recovery software is the best choice to heed if you wish to recover your lost data on account of restoring iPhone from iCloud backup file.